This dish was divine. I'm just going to put that right out there to start. Trav and I each ate half the squash, and the moment I took my first bite, I was loath to give him his at all! 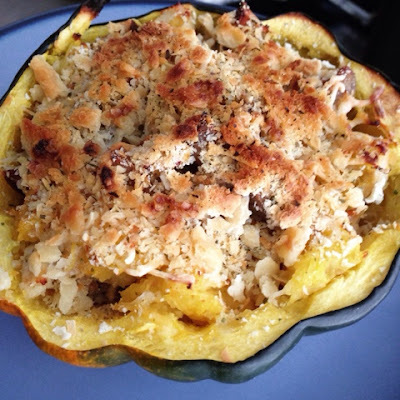 This recipe is another adaption from Good Life Farm. What can I say? She's been giving me some great ideas over the past few months. She used sausage in her's, but I had some awesome chicken thighs already cooked up in my fridge, so I used those instead. But lets get to the recipe. 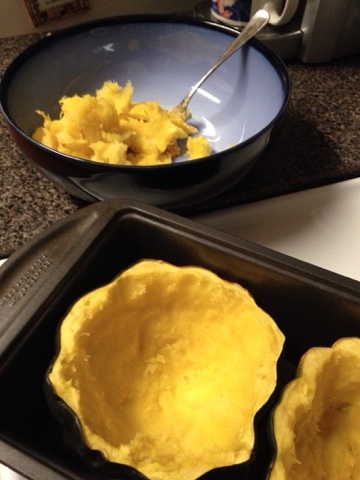 1 Acorn Squash, cut in half, seeds scooped out. 1. Preheat your oven to 375*. Bake your cut Acorn Squash for 30 minutes, until soft. 3. 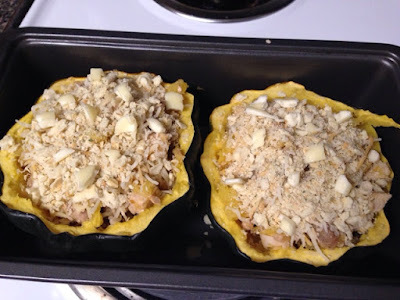 Remove squash from the oven, and let cool slightly (until you can work with it without burning yourself!). Scoop out the insides, being careful not to break through the skin. 4. 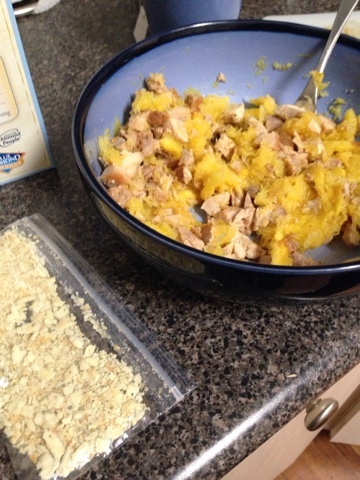 Give the squash a gentle mash to break it up and mix in the minced garlic, plus salt, pepper, and parsley. 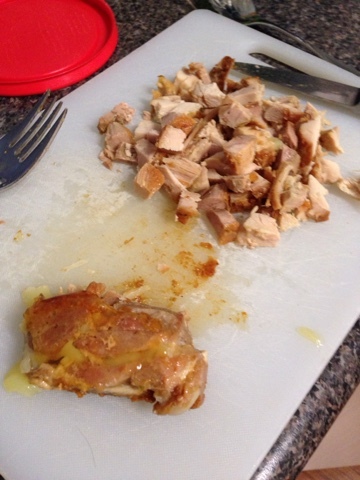 Mix in the chicken to combine. 5. Scoop the chicken/squash mixture back into the squash skins, and top with a sprinkle of cheese, then a layer of breadcrumbs, and finally dot with butter. 6. Pop the dish back in the over and bake for another 20 minutes. I flipped my broiler on for a few minutes at the end to get a nice brown on the top, too. After that is the best part... the eating. Make this. Seriously. Its filling and flavorful, and good for you. Then come back and report on how you like it.